Tina Toth at Hollywood Vine has a theory about Hollywood. She shares it while slicing cheese and hard salami for a charcuterie platter at her place on Harrison Street. The wine bar has a serve-yourself snack area with good prices, like three bucks for a chunk of aged gouda and sampling of fantastic goat cheese for a dollar. Tina says it with a half-cocked smile and a chin that rises higher with the proclamation. This is the pride of Hollywood: In a South Florida that’s been gentrified, that’s been rehabbed and refurbished, Hollywood remains a city where differences are welcome. Don’t mistake this for a city with a lack of money or a shortness of class. Hollyweird, as some locals call it, has plenty of waterfront spreads and historic Spanish manors and beachfront condos. But the people who settle here tend to be those who shun gated communities and welcome the chance to share a sidewalk with someone who’s entirely different from themselves. Next to the wine bar, at the corner of Harrison Street and South 21st Avenue, is Polestars. Women exercise behind curtain-covered windows. It happens again across the street at Lola’s On Harrison, a place where the staff takes great pains to remember you, or seem like they do, while serving up some of the best bistro fare anywhere. In front of Lola’s on this Saturday night, groups of friends have begun the gallery hop for downtown Hollywood’s monthly art walk. In true Hollywood fashion, it attracts everyone from bearded hipsters to silk-shirted retirees. A few doors down from the Hollywood Vine is the Europa Restaurant & Social Club, where a group of men have gathered at happy hour at outside tables to bicker in Romanian while drinking bottles of water. The place is outfitted in black tables and chairs and lots of curtains. It’s often the site of weddings and family reunions for eastern Europeans. From Coral Gables to Palm Beach Gardens, there’s nothing like it. A rope line has formed across the street. It’s meant to channel people into an alleyway where a folding table offers cups of wine and cubes of cheese. Girls are offering cups of coconut water from a sponsor. Yuppies and tattooed artist types mill around, gawking at a wall recently taken over by the artist Tati Suarez. She created what looks like a party of mermaids with bright eye shadow, hair that flows like a rainbow of ocean waves, and tails that look adorned with jewels. It’s stunning. It’s also one of several murals that have taken over walls in downtown as part of a project put on by the Hollywood Community Redevelopment Agency. This isn’t the gritty, graffiti-culture murals of Miami’s Wynwood; here there are 10 whimsical and family friendly paintings spread out across two blocks west of Young Circle. Sure, there are empty storefronts in downtown Hollywood, but there are few places with more square feet of public art. The storefront east of the alley holds Gallery 2014, with stark white walls that stretch high to exposed rafters and art that’s both fascinating and approachable. Three of the artists who have work showing in the gallery have set up easels in the front, and art walkers have stopped to chat about inspiration and what life must be like painting for a living. 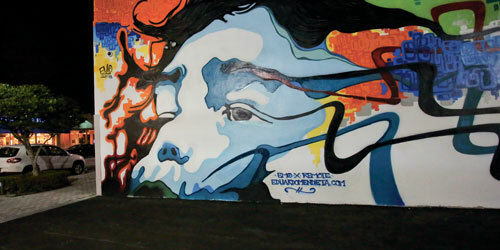 Heather Calderón is one of them, and her art is scattered on walls nearby. Skeletons, mostly. But instead of spooky, she’s made many of them in bright and whimsical scenes, like the sun-colored skeleton street party. Heather is smiling and nodding along as an older woman is telling her a story about a long-ago vacation. Not far away, a three-piece band is setting up a few doors down in front of the Montecristo Lounge cigar shop. This is something of a gathering spot for cigar aficionados and people who don’t mind the smoke. They spread out over a collection of mismatched chairs and tables waiting for the band to begin. For now, as the crowds just begin to show up around 7 o’clock, the main sound is the slapping of dominoes from a group of guys who have been trading wins for hours. As the art walk turns into a steady trickle of walkers, bands have set up on the corners. Artists paint on easels in random spots along Harrison Street. The crowd is impossible to peg, with a guy in a hoodie walking a pitbull, and a woman in native South American clothing clutching two children, and the casually dressed heading to dinner. In the old Sage spot, a French place called La Coquette has fired up the wood-burning oven with foot-high flames that can be seen from the street. The steak-frites comes with a pile of fries taller than the wine glass next to it, and the flatiron glistens with an herbed butter melting across the top. Sounds fancy, but this is Hollywood, so it’s $24. There’s a lot of talk in town lately about Jimmy Buffett’s Margaritaville Hollywood Beach Resort taking over an entire chunk of the beach. The $147 million mega development will plop down in a place that otherwise seems stuck in a pre-Miami Vice era of South Florida, with its French Canadians that pour in every winter and affordable rentals just off the sand. Buffett’s joins six other new developments near the beach’s Broadwalk, and people have begun to wonder if Hollywood is next for a developer-induced makeover. But directly across from Margaritaville is Le Tub, that dive made of driftwood that cooks tall burgers on an ancient charcoal grill. You fetch your own water at Le Tub from a plastic Igloo cooler. Those burgers, heralded by GQ magazine and Oprah as the best in the country, still come on throwaway plates. And so, even after Margaritaville and all the other new developments, there will still be Le Tub, that place where riffraff mixes with millionaires pulling up on yachts, and French Canadians who would rather put gravy on their fries, and struggling artists, and socks-and-sandals retirees, and any other kind of person. They’re all welcome in Hollywood, that haven for the Mutt Society. The 1924 mansion that houses the center serves as a fine work of art itself, with a row of Spanish-mission-style arches leading the way to the entrance. The exhibits here have ranged from kid-friendly art made of LEGOs to the avant garde work of Broward County photographer Sarah Michelle Rupert. There are activities for students all year, including “summer” camp in September and October. Hollywood’s official monthly art walk now boasts more than a dozen participating businesses, but the 10 murals spread out through downtown Hollywood serve themselves as a fine art tour. The Community Redevelopment Agency, which began the mural project in 2012, even has a handy map of the works on its website (hollywoodcra.org). Those who search them out will be rewarded with whimsical and detailed works from well-known muralists including Eddie Mendieta, Tati Suarez, and Ruben Ubiera. The 2 ½-mile stretch of bricks that is the Broadwalk boasts an impressive number of accolades, like “Best Beach for Families” from Fodor’s and Travel + Leisure’s award for “America’s Best Beach Boardwalk.” Along the way are three oceanfront parks with playgrounds and paddleboards, plus regular concerts at the Hollywood Beach Theatre. Especially in winter months, be sure to follow the painted directions for walking and biking lanes. Heading north, the mostly historic homes that line the Intracoastal in downtown Hollywood give way to three miles of uninterrupted mangrove coastline. Waterways cut through the mangroves to the vast lake. For a taste of true old Florida, rent a canoe or kayak and traverse the lake or follow paths into the mangrove swamp. For the less adventurous, see it all from a distance at the 68-foot observation tower at the Anne Kolb Nature Center.